A 50-year old woman known to many as Brickhousechick, was arrested for breaking and entering and disorderly conduct at the infamous Boehner‘s Hardware Store, located at -0 Congress Avenue, last evening. At 11:53 pm, police were called to Boehner’s with a report of a woman seen running around inside the store, pushing a wheelbarrow filled with 50 sledgehammers. When the police arrived at the scene, Brickhousechick was sitting in the wheelbarrow on top of the sledgehammers, licking them – one by one. Officer Very Hairy Reid, cautiously approached the woman who then fled and hid behind the toilet plungers, while hugging two sledgehammers she managed to grab from the wheelbarrow. Reid immediately radioed in for back-up. Brickhousechick, was reported to appear very afraid. She knew that what she had done was wrong but could not control the urge to lick those hammers, not unlike what she had seen her idol, Myley Wreck Ball do, on TV. Rookie Officer Cruz soon joined officer Reid at the toilet plunger aisle. Officer Reid looked at Cruz and asked him what on earth he was holding in his hand besides his handgun. Cruz smiled broadly and showed Reid his copy of Green Eggs and Ham. He explained to Reid that reading the book to Brickhousechick would make her happy, therefore encouraging her to surrender. 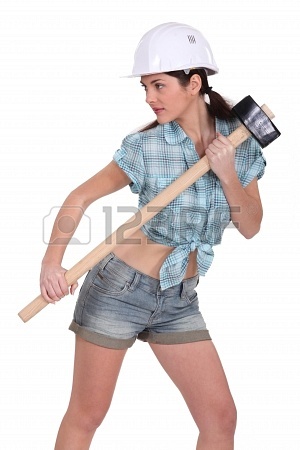 Feeling a tad intimidated by Cruz and having a sudden urge to drink tea, Brickhousechick gave up one of the hammers. Officer Reid called her “crazies” and demanded sledgehammer number two. Brickhousechick then began to undress and stick her tongue out. She asked to speak to her attorney, Robin Thicke, Esq. at once! She offered the officers a deal. She would give up the last hammer, if and only if, they provided her with a giant foam finger. Reid and Cruz were perplexed. First of all, why would she need a foam finger and secondly, where would they find one at this ungodly hour? That’s when Cruz remembered the party he had recently attended at Captain Pelosi’s house the previous weekend and said, “Let’s call Captain Pelosi, she has a ton of these in her bedroom”. Officer Reid blushed but picked up his radio and called the Captain. Captain Pelosi was busy showing Robin Thicke, Esq. her room, but decided to answer the call. 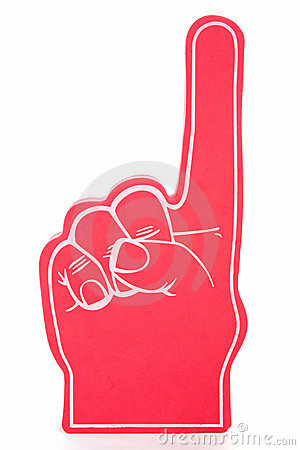 “I am sending Thicke right over with my biggest foam finger”, said the Captain. After 6 tense hours of negotiations, the police were able to trade the biggest foam finger they had ever seen in their lives, for the sledgehammer at which point the dangerous criminal, was subdued. Brickhousechick was soon arraigned at the Supreme Court and bail was set at 800,000 furloughed federal employees, pending her trial. ← Are you still eating? Yeah, that definitely tickled my funny bone. How sad is it that I’m starting to feel sorry for Miley? I heard some sports commentator call her a no-talent a week or two ago and actually wanted to come through the tv at him. All her theatrics aside, she’s got a very powerful, talented voice. Any doubters should do a YouTube search for her remake of Lilac Wine…she does it acoustic and outdoors…and it’s amazing! You are a criminal for making all of the readers laugh their a***s off and have to pick them up and try to sew them back on, mine included. If I get arrested, can we have adjoining cells? Clever use of current events. LOL! Well played, Brickhouse Hammer Girl. Well played. So much better than reading about anything those idiots are doing. Oh that’s so hilarious!!!! And that punchline! Glad you liked it, Linda. You gotta laugh to make it through these crazy times. This is like one of those Law and Order episodes, with the disclaimer at the beginning that it’s only partly based on true events. Nice take on current events. Am feeling the frustration of the workers. Ak. Well, at least there are plenty of furloughed employees to use as bail. At least you weren’t arrested for stealing Fruit Loops….hee hee. Visiting from Blogger Idol! Just coming back from reading yours! Hilarious! Actually, stealing fruit loops would be a lot more fun than sledgehammers. I love fruit loops!